City Hall as viewed to the north in GTA IV. The central park and the pinnacle of the city hall building are seen in the center and the background. City Hall is a neighborhood in southern Algonquin, Liberty City. It is bordered to the north by Emerald Street (Little Italy and Suffolk), to the west by Union Drive West (Castle Garden City), to the south by Barium Street (The Exchange), and to the east by Columbus Avenue (Chinatown). City Hall is the government seat of Liberty City and, as such, is a center of political activity in the city. The neighborhood serves as the civic center of not only Algonquin, but the entirety of Liberty City. It's home to the mayor, Julio Ochoa, of course, and the neighborhood is primarily commercial and governmental in nature, but a few residential sectors exist along its eastern face, while the centerpiece of the district is a delta-shaped park bordered by Liberty Lane, Emerald Street, and Denver Avenue. City Hall's most prominent landmarks includes a low-rise town hall at the northern edge of the park, and a towering municipal complex to the east, which is distinguished by its street level central arch and cylindrical crown. Both buildings are presumed to house the city's administrative organizations. The Civic Citadel/Woodworld Building, located on Liberty Lane between Diamond and Calcium Streets, is a major attraction, as well as a shopping destination with many stores present in its ground concourse. City Hall is a detailed imitation of Civic Center, Manhattan, with landmarks duplicated in the district including New York City Hall, the Manhattan Municipal Building (located across Denver Avenue from the park), and Woolworth Building (as the looming Civic Citadel/Woodworld Building the background), and the delta-shaped New York City Hall Park, which imitation forms the heart of the district. Also incorporated into the area are buildings similar to 250 Broadway and 253 Broadway (which is also reused in various other portions of downtown-midtown Algonquin) are also reproduced and incorporated into the district. While heavily weighted towards the civic center of the city, the park area also representative of Bowling Green as evidenced with the presence of a large building to the south based on 26 Broadway (Standard Oil Building), simplified and reduced in size, with the crowning roof in the game's rendition also noticeably toned down and featuring only stepped layers in place of a pitched roof. The Liberty City Subway system serves the neighborhood. The City Hall station, located at the intersection of Denver Avenue, Liberty Lane, and Calcium Street is served at all times by the Algonquin Inner Line. A second station, Feldpsar is located in the northwest corner of the neighborhood on Union Drive West, between Frankfort Avenue and Emerald Street. Feldspar is served at all times by the Algonquin Outer Line. City Hall is featured in the mission "Entourage" in GTA IV, where Gravelli asks Niko to stay in convoy with a bunch of City Hall cars to take the government member Bobby Jefferson to a meeting at the city hall building where he gives a speech against gang problems in the city. The convoy is ambushed by a group of Russians, and Niko has to protect Bobby. In the GTA III—GTA Vice City Stories rendition of Liberty City, a building similarly based on the New York City Hall building exists on the northern edge of Belleville Park in Staunton Island (the equivalent to Manhattan in Grand Theft Auto III and Grand Theft Auto: Liberty City Stories). 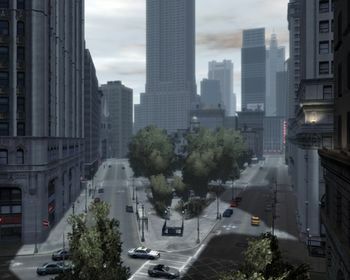 The skyline along Liberty Lane as viewed to the southwest in GTA IV. The Civic Citadel/Woodworld Building is visible to the left. GTA IV's rendition of the New York City Hall building. GTA IV's rendition of the Manhattan Municipal Building. This page was last modified on 18 July 2014, at 21:45.